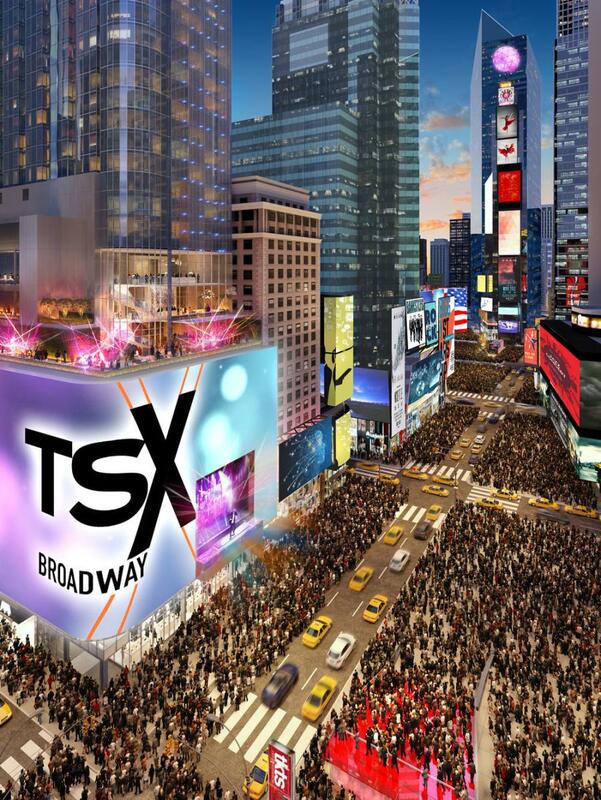 TSX Broadway will bring a new outdoor performance venue to Times Square, enabling events that last for days without any interruption to the streets or pedestrian flow for the first time. The stage will be suspended 30 ft. in the air, overlooking the iconic TKTS ‘Red Steps’. L&L Holding Company, Maefield Development and Fortress Investment Group announced that its recently revealed 46-story, $2.5 billion Times Square tower is fully capitalized, with construction expected to start in January 2019. UBS led a new round of equity investments totaling more than $780 million, bringing the total equity in TSX Broadway to more than $1 billion. UBS's global network of ultra-high net worth and family office investors provided a majority of this equity, with the remainder coming from existing partners and a series of additional institutional limited partners. Goldman Sachs provided the remainder of the financing needed to begin construction with a $1.125 billion construction loan. "Our goal with TSX Broadway is to provide brands an unprecedented canvas for innovation in the heart of Times Square," said David Levinson, chairman and CEO of L&L Holding Company. "Our investors share our vision for leveraging Times Square's unique value as the predominant global destination of retail and engagement." "Direct private equity and real estate comprise nearly 1/3 of the portfolios for ultra-high net worth and family office investors," said Tom Naratil, UBS co-president of Global Wealth Management. "As the world's largest wealth manager, our advisors have deep relationships with ultra-high net worth investors globally. In collaboration with our leading real estate investment banking team, we are uniquely positioned to offer eligible clients high-quality, differentiated, direct investment opportunities, such as TSX Broadway." "Times Square is the most important urban space in America, it represents who we are in the world, and has been the home of the live arts for more than a century," said Mark Siffin, chairman and CEO of Maefield Development. "We are proud to work with such an incredible community and group of investors who share our vision for the project and its role in the future of this iconic global destination." The investments signal the enormous interest and confidence in the investor community for TSX and its new approach to brand marketing. TSX Broadway is a first-of-its-kind, 46-story, full-building promotional platform built for a new era of retail, advertising and marketing. Located in the heart of Times Square at 1568 Broadway, the project builds on the rich advertising and entertainment legacy of Times Square to create one building that can deliver an unprecedented range of customer engagement, entertainment and experience. TSX Broadway is the only full-building promotional platform in the country, located in the single best branding location in the world. Exclusive features of TSX Broadway include the only permanent outdoor stage in Times Square and the most technologically advanced signage and technology package in New York City. The only permanent outdoor stage in Times Square — TSX Broadway will bring a new outdoor performance venue to Times Square, enabling events that last for days without any interruption to the streets or pedestrian flow for the first time. The stage will be suspended 30 ft. in the air, overlooking the iconic TKTS ‘Red Steps'. A state-of-the-art advertising canvas —The signage technology, scope and integration at TSX Broadway creates a genuine full-building promotional platform. A 46-story integrated, state-of-the-art façade lighting system will be able to connect all the signs visually to create a single stunning performance from the street level to crown. TSX Broadway's cutting-edge 18,000-sq.-ft. LED sign will be Times Square's largest, highest resolution advertisement, with unique capabilities to interact with and complement the stage located within it and engage directly with the audience. In addition, the building will be comprised of dedicated retail, food and beverage and hospitality spaces. Ground floor retail — 75,000 sq. ft. of flexible retail space spanning across 10 floors, including 15,000 sq. ft. on the ground floor and 100 ft. of storefront facing Times Square, will accommodate 15 million guests annually. Food and beverage — TSX Broadway will be home to a 10,000-sq.-ft. outdoor terrace, the largest in Times Square. The 30,000 total sq. ft. dining destination will overlook the daily activity of Times Square and will have a dedicated entrance with a 90-ft. exterior sign. Hotel — Every room of the 669-key luxury hotel will feature direct views of Times Square and floor-to-ceiling glass windows. Thirty "Ball Drop Suites" will be perfectly positioned to comfortably view the excitement and energy of New Year's Eve. UBS Investment Bank acted as exclusive placement agent and Cushman & Wakefield acted as advisor on the equity raised. HFF acted as advisor for the construction loan. For additional information about TSX Broadway and Times Square, visit TSXBroadway.com.